As Nelson Mandela Turns 95, South Africa Celebrates : Parallels Mandela remains hospitalized, but South Africans take the opportunity to honor the man who symbolized the anti-apartheid movement. School children singing to Nelson Mandela on his 95th birthday in Johannesburg. 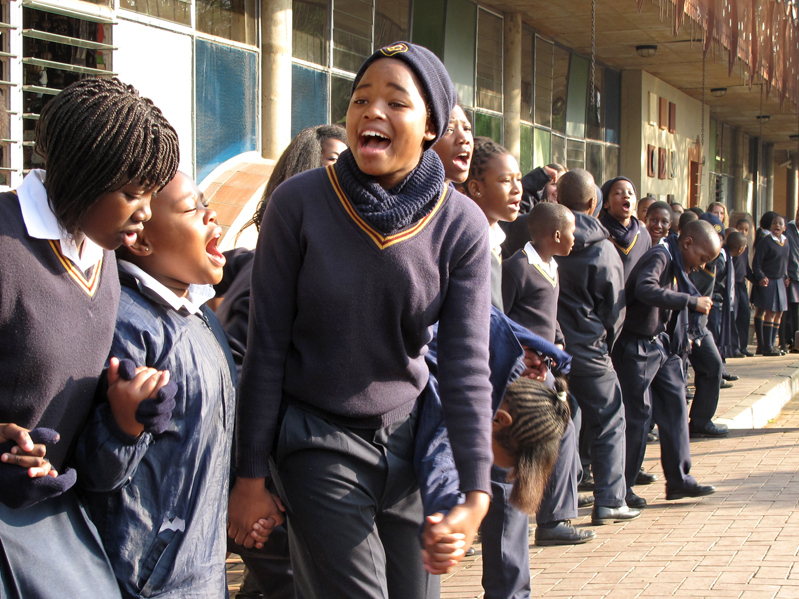 The students sang Happy Birthday, spiritual hymns and old anti-apartheid freedom songs. 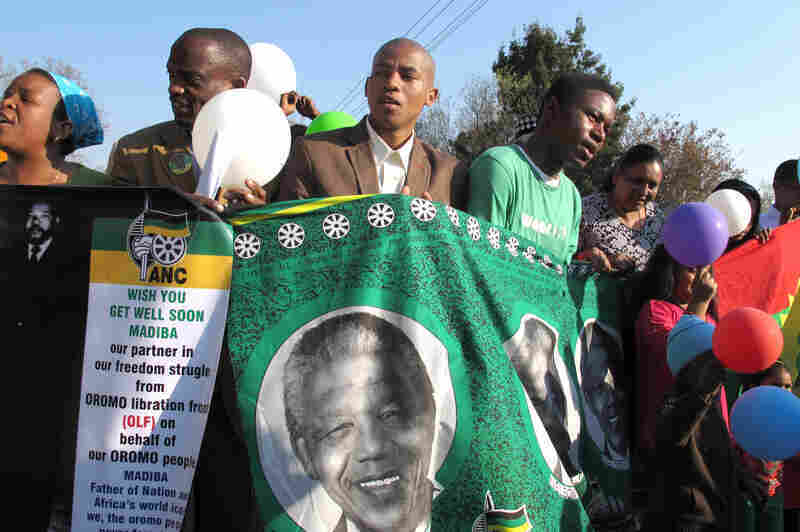 Supporters of Nelson Mandela rally outside the Mediclinic Heart Hospital in Pretoria, South Africa, where he has been treated for more than a month. The anti-apartheid icon turned 95 on Thursday. President Jacob Zuma's office has said that Mandela is in "critical but stable" condition, though Mandela's daughter Zindzi said Wednesday that her father was making "remarkable progress" and could be released soon. The Nelson Mandela Center of Memory asked South Africans and people around the world to spend 67 minutes Thursday volunteering in their communities in tribute to the ailing former president. The 67 minutes represents the 67 years Mandela gave in public service fighting against the apartheid system of segregation and later as a statesman. Ever since he was hospitalized more than a month ago, small shrines to Mandela have popped up all across the country. His picture hangs in shop windows. The newspapers and TV stations give daily updates on Madiba, his clan name that many use when referring to him. Brenda Motseari, a teacher in the township of Soweto, says Mandela remains a huge figure in South African life. "Nelson Mandela is a father, a mentor, a motivator, a director. He's everything to South Africans," she says. Motseari had just come out of a Mass at the Regina Mundi Catholic Church in the Rockville section of Soweto. A stained glass window depicts Mandela in a jacket and tie with his hands raised as he addresses a crowd. 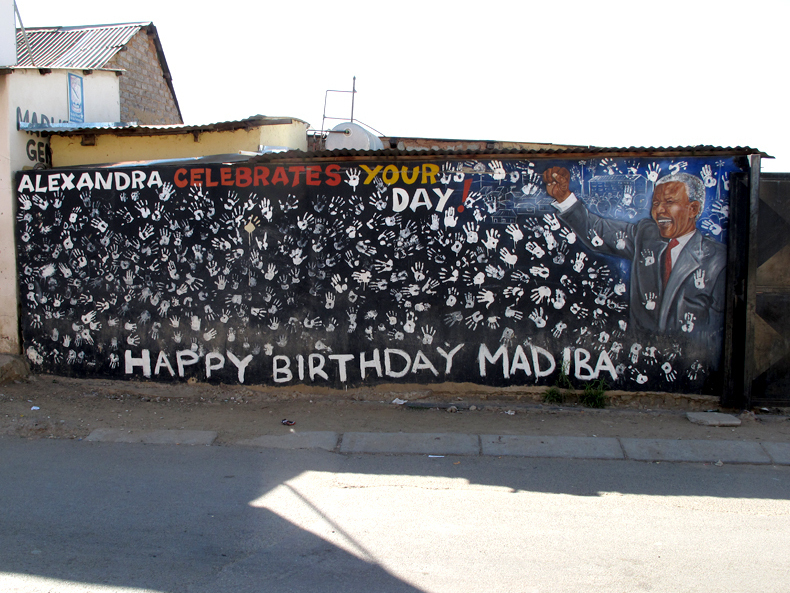 A wall dedicated to Mandela in the Alexandra Township in Johannesburg. It's near the place where Mandela rented a room when he first moved to Johannesburg in 1941. The scene resembles the one on Feb. 11, 1990, when Mandela was released from prison. Standing on the balcony of Cape Town City Hall, he greeted a crowd of hundreds of thousands of people. Motseari says she remembers that day clearly. She'd just had a baby, and she was glued to the television. She says that day is still the most powerful image she remembers of Mandela. "That's my memory [of him], the first day when he picked up the fist after coming out of prison," she says. "I was watching attentively and then he clenched the fist to say, 'Amandla' [power]." In that speech, Mandela declared, "Today the majority of South Africans, black and white, recognize that apartheid has no future." Before those remarks, most South Africans didn't even know what Mandela looked like. Pictures of him had been banned by the apartheid government. Stepping out from prison, Mandela called for a negotiated end to apartheid and an end to white minority rule. That eventually happened and in 1994 Mandela was elected president in South Africa's first nonracial, democratic elections. The pastor at the Regina Mundi church, Sebastian Rossouw, says Mandela's life continues to be an inspiration to South Africans. "Growing up in apartheid years as a young boy one was not free," the priest says. Rossouw and his family couldn't travel freely. His father wasn't allowed to set foot in certain parts of town. Blacks weren't allowed to vote. There were separate buses, schools and toilets for whites. Interracial marriages were forbidden. Blacks and coloreds ended up in the worst jobs. Educational options for Rossouw were restricted by law. But the priest says Mandela made it clear that any obstacle, any injustice can be overcome. "The legacy that Mandela brings is that despite what the past has dealt you, do not allow it to determine your future," Rossouw says. "For many of us, myself included, that's a message that we've taken to heart. Yes, we have a bad past but this will not affect the future we are looking towards."